While we waited for the dishes to be prepared we ordered a few of our favorite sushi rolls. (It should be noted that the sushi at Prime should not be missed.) We enjoyed the Stamford Landing, the Mount Fuji and our favorite, the magical Green Lotus, with spicy tuna with tempura crunch and Asian pear neatly wrapped in avocado. Four new specialty drinks have been added to the menu. The Northfork Farm Stand offers a unique take on the flavors we have come to associate with those late summer/early fall road-side farm stands. Deepwells gin is combined with honey, lemon, sugar snap pea puree and a tomato-basil infusion. The Ahi Aho was first introduced in September at the Greenwich Wine + Food Festival. Made with LIV Vodka, Chambord, St. Germaine, lemon juice and a blueberry-jalapeno syrup offers the perfect blend of sweet and a little bit of heat. The BRG VIP, named for the Bohlson Restaurant Group (Prime’s parent company) is the season’s signature drink made from Redemption Bourbon, lemon juice, honey, strawberry puree and basil leaves. The drink is garnished with a candied lemon peel and is served shaken, not stirred! Lastly we have the 327 and Counting named for the main ingredient, Ketel One, which is celebrating its 327th anniversary. The vodka is infused with limoncello, strawberry infused aperol and prosecco for a refreshing, seasonal and festive drink. 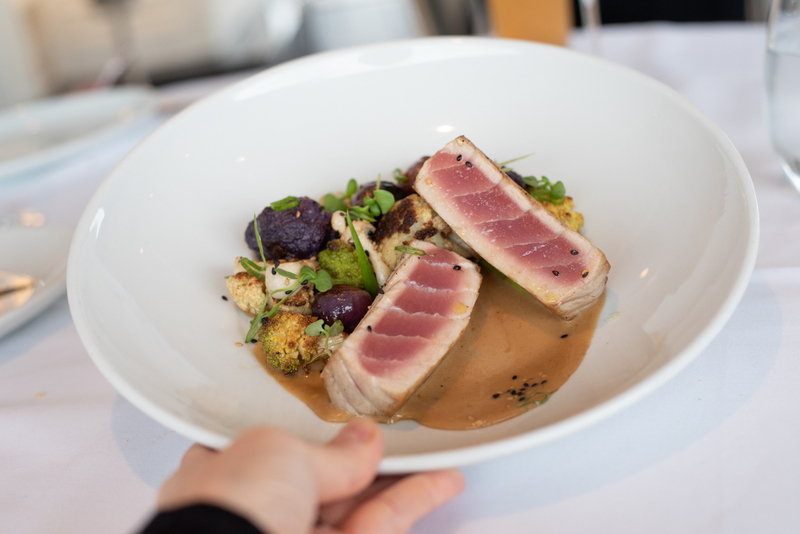 The first dish to presented to us was the Pan Seared Tuna. A beautifully presented piece of yellowfin prepared with soy butter, caramelized hon shimeji mushrooms and tri-colored cauliflower. Inspired by the flavors of the fall season, earthy mushrooms are accompanied stunning hues of cauliflower, sauce and butter. An unlikely combination, perhaps, but a winning one at that. For those of you who prefer the surf over turf, you might also consider the Scottish Salmon which is accompanied by a light salsify (a root vegetable related to the dandelion family) puree, roasted baby beets, carrots and cherry tomatoes in a lemon emulsion sauce. The naturally sweet root vegetables lend themselves beautifully to the salmon. Then there’s the Pan Roasted Duck, decadently divine, with a honey mustard glaze, lollipop kale and Fresno chili. Duck lovers will not be disappointed in this perfectly cooked, tender, flavorful dish. The entrée special, and the piece de resistance, is the 28 day dry aged wagyu strip accompanied by a truffle soy emulsion. The meat which was divine, was incredibly rich in flavor and yet so tender it practically melted in our mouths. This dish is a must for the true steak lover. While the Cabana is now closed for the season, Prime now offers Brunch on Sundays with live jazz and an array of both savory and sweet dishes; many classics and a few modern takes on the dishes of our youth. Diners can also look forward to a special Sunday night three-course Prix Fixe menu with multiple selections including the Chef’s soup of the day and the daily selection of fresh fish, for only $45. Sundays at Prime are now better than ever. On Wednesdays Prime offers special Wine Dinners where creative menus are carefully paired with wines chosen to enhance each course’s specific attributes. This is more of an experience than a dinner. The Wednesday Night Wine dinner allows you to discover nuances in how food and wine interact. For menus, special events and more information, please visit the Prime website, http://restaurantprime.com/stamford.